Recipe for Cauliflower Broccoli Salad Recipe with a sweet and savory homemade dressing. Fresh cauliflower and broccoli florets with crispy bacon pieces, sunflower seeds, dried cranberries, and cheddar cheese. This easy broccoli salad is the best kind of salad for potlucks, parties and family gatherings and especially around the Holidays! It doesn’t get soggy quickly and will be a hit with kids and adults alike! PIN recipe HERE! Follow Valentina’s Corner on Pinterest for more inspiration! This creamy broccoli salad recipe served cold is so ADDICTIVE! 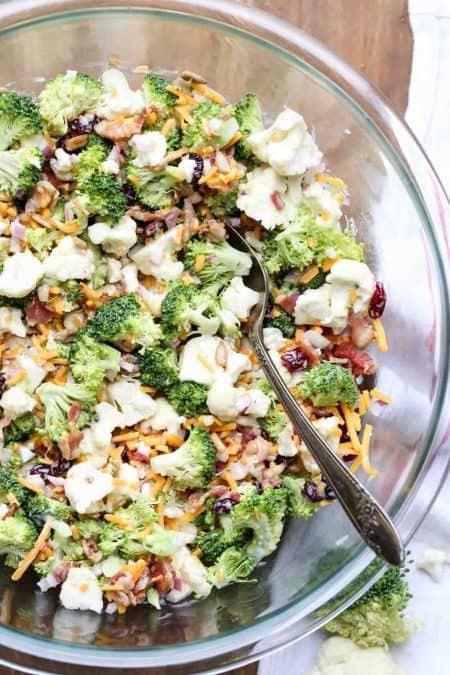 The raw cauliflower and broccoli with cheddar cheese and crunchy sunflower seeds and craisins is such an unexpected yet perfect sweet and savory combination. Do I need to cook broccoli or cauliflower? No! 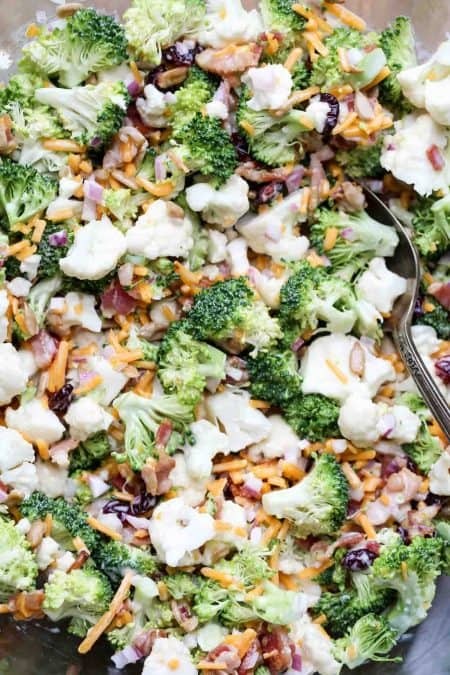 For this broccoli salad with bacon, the broccoli and cauliflower are added to the recipe raw! When the sweet and savory dressing is added, it penetrated into the raw vegetables and they become creamy and so flavorful and rather enjoyable uncooked. Even though the salad is great as is, you can substitute the craisins for raisins or dried cherries. The sunflower seeds may be substituted for sliced almonds. If you don’t like cheese, leave it out completely. The grated cheese may be substituted for finely cubed mild cheddar cheese. Cook bacon pieces, set aside to cool completely. Next cut broccoli and cauliflower into small florets. Grate or a block or cheddar cheese. Or use pre-shredded cheese. Then finely chop the red onion. Prepare the homemade dressing by combining the mayonnaise, vinegar, and sugar. Lastly, combine all of the ingredients and enjoy! Also, I just ordered this set of salad bowls and love them. Can you prepare this broccoli salad ahead of time? This is a great make-ahead salad. Prepare everything per instructions and refrigerate the salad cover, keep dressing in a separate container. Then just combine dressing with the salad right before serving and enjoy. Broccoli Salad– A twist off of this salad recipe! 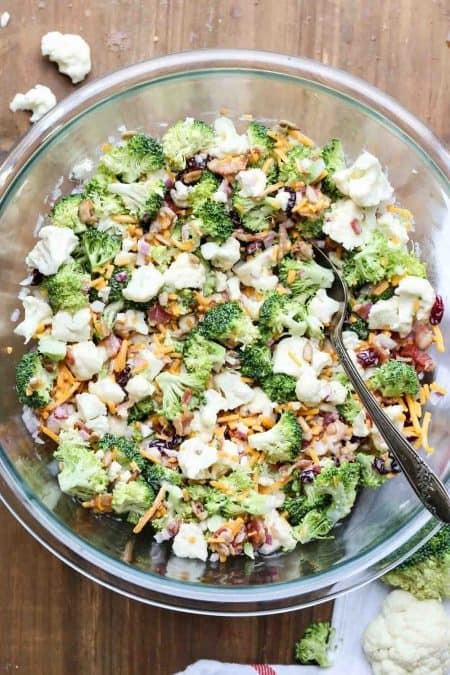 Broccoli Cauliflower Salad– The perfect salad for picnics! Bacon Cauliflower Salad– For the bacon lovers. 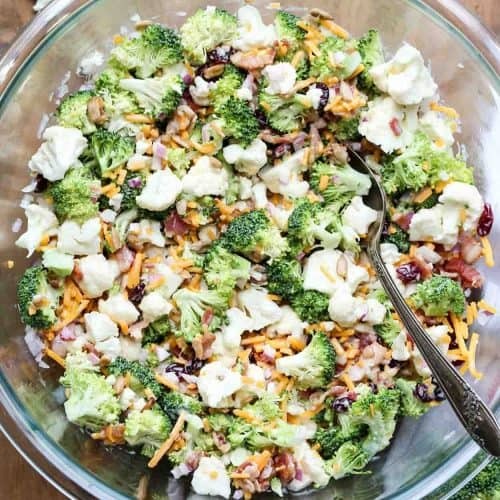 Easy and quick recipe for a cauliflower broccoli salad recipe with dried cranberries, cheddar cheese, bacon bits, red onion and a homemade dressing. Cook bacon pieces, set onto a paper towel to cool. Cut broccoli and cauliflower into small florets. Finely chop onion. Prepare the homemade salad dressing. Combine the mayo, sugar, and vinegar. 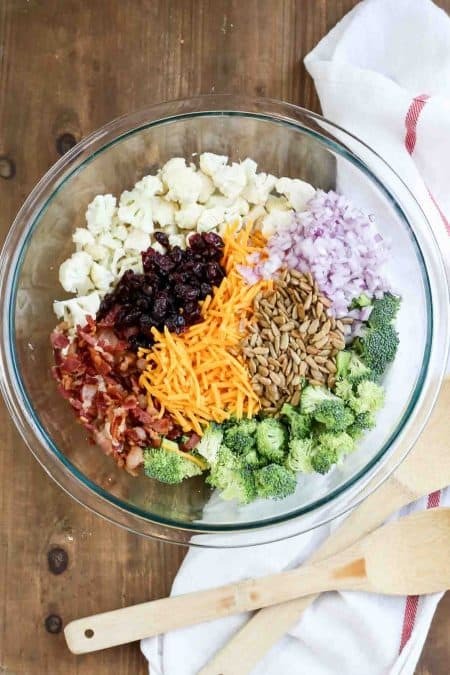 In a bowl add the broccoli, cauliflower, cheese, sunflower seeds, cranberries, bacon and red onion. Add dressing. Combine well and enjoy! Great salad. Not sure where you got 10 min prep. I must have done something wrong. Took 20 mins to bake bacon and I cut up vegetables while that was baking. Had to cool bacon before mixing. Made dressing while bacon cooled. Then time to mix all ingredients evenly including dressing. But salad is well worth the effort. Hi, Roxanne. I’m so glad you enjoyed the salad – makes me so happy. Ha, you are right, the recipe time is a slightly off. The cool and cooling time was missed, recipe is edited. Thanks for catching that.